Amid a continuing blame game over seat-sharing in Delhi, Rahul Gandhi and Arvind Kejriwal on Monday engaged in a public spat, with the Congress president accusing the Aam Aadmi Party of taking a U-turn over alliance talks and the Delhi chief minister hitting back. The Congress chief said that while the doors of his party are open, time is running out, but Kejriwal slammed him, questioning what U-turn was he talking about as the talks were still on. He also accused Gandhi of helping the Bharatiya Janata Party by 'dividing anti-Modi votes in Uttar Pradesh and in some other states'. Amid this sparring on Twitter, sources claimed the two sides were still 'engaged' in taking the alliance talks forward and are likely to meet again on Wednesday over seat sharing between the two. The Congress chief said his party is willing to give four of the seven Lok Sabha seats in Delhi to the AAP to ensure that their alliance defeats the BJP, which had won all the seven seats in 2014. 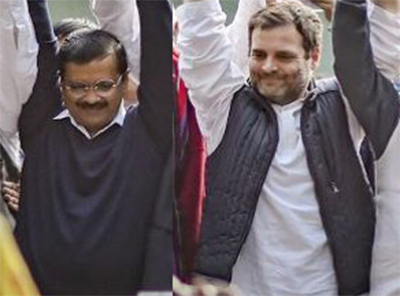 'An alliance between the Congress and the AAP in Delhi would mean the rout of the BJP. The Congress is willing to give up four seats in Delhi to the AAP to ensure this. 'But, Mr Kejriwal has done yet another U-turn. Our doors are still open, but the clock is running out,' Gandhi tweeted. 'Your tweet shows that an alliance is not your desire but only a pretension. I am pained that you are giving mere statements,' he said. 'Today, the foremost issue is to save the country from the threat of Modi-Shah. Unfortunately, you are helping Modi by dividing anti-Modi votes in Uttar Pradesh and in some other states,' Kejriwal tweeted in Hindi. Congress insiders claimed that party's in-charge P C Chacko on Monday sent messages to AAP leaders Manish Sisodia and Sanjay Singh, seeking their answer. "The AAP leaders have been asked to make up their mind on alliance in Delhi alone considering the ground realities," they said. AAP sources said that Singh and senior Congress leader Ahmad Patel will meet on Wednesday for discussing alliance prospects. The Congress has offered the AAP 4:3 seat-sharing formula, four Lok Sabha seats for the ruling party and three seats for itself. The arrangement has been arrived at on basis of the vote share of both parties in 2017 civic polls here, they said. The Congress has accused the Kejriwal-led outfit of backing out from its commitment, as it is demanding seats in Goa, Haryana, Punjab and Chandigarh, besides Delhi for a pre-poll understanding with the Congress. AAP leader Sanjay Singh said in response to Gandhi's tweet, "The Congress is not giving even a single seat to the AAP in Punjab where it has four MPs and 20 MLAs, and in Haryana." "In Delhi where the Congress has zero MPs and MLAs, it is demanding three seats. Is this how agreement happens? Why do not you want to stop the BJP in other states," he asked. The AAP has already announced its candidates on the seven parliamentary constituencies in Delhi, while the Congress has finalised names of its candidates which could be announced soon. The 4-3 formula suggested by Congress to AAP for an alliance in Delhi is based on the results of the 2017 municipal elections, former Delhi Congress chief Ajay Maken explained on Monday. After Gandhi's tweeted, Maken on the social media platform explained how the Congress party's formula came about. 'Why 4-3 formula between AAP-INC?' Maken tweeted along with charts to explain the rationale behind the formula based on the 2017 municipal poll results. His analysis in essence is based on the vote share and seats (wards) won by Congress and AAP in the municipal polls. As per Maken's charts, Congress won 31 seats and AAP won 49 seats, polling 21 per cent and 26 per cent votes, respectively, in the elections for three municipal corporations in Delhi. Further, as per vote share of Congress (21 per cent), he calculated the seat share of the party for Lok Sabha polls to be 3.13 approximated to 3. The AAP's seat share for Lok Sabha thus comes to be 3.87 per cent approximated to 4. Also, as per number of seats won (31), the party's seat share for Lok Sabha polls comes around 2.71 approximated to 3. The AAP's seat share based on 49 wards won by it, is calculated to 4.29 per cent or 4. Does Rahul have a plan for 2019 election? Is Congress serious about elections?